Discussion in 'Hardgoods: Skis, Bindings, Poles, and More' started by jmeb, Nov 30, 2015. We're bound to have one, so I'll go first. My SO (5'9") started her second season this year on beginner skis (Volkl Attiva Oceana 162s.) She demo'd a lot at an early season demo day which gave me a good idea of what she likes in a ski. In order of importance: lightweight!, ~168-173 was the sweet spot, 80-90mm waist, medium flex and turn radius, directional). She's improving quickly and gaining confidence this year in her first 5 days on the mountain. I knew it was only a matter of time before an upgrade was necessary, and didn't want her to start on gear that might hinder learning the basics and building confidence. Money is tight as I'm saving for a house, and she's in grad school. But tomorrow I'll take delivery of these: http://www.ebay.com/itm/201468361653 for her early Xmas gift. 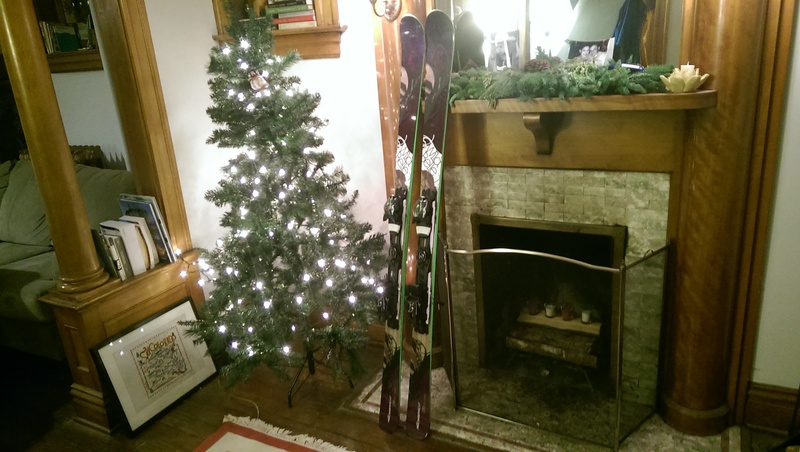 $200 for new 2014 Nordica Wild Belles with integrated bindings, shipped. I have the week to tune, wax, and setup the clamps before she returns this weekend. A quick torque test at the hill in the morning and we'll be ready to go. Ron, John Webb, KingGrump and 2 others like this. Not sure exactly what they are. Some sort of system binding labeled as "N ADV P.R. EVO" . Re-branded markers? Decent system? They have the right DIN range for her, and--importantly--are green. I'm hoping when listed as "unmounted" that the system is installed and just need the heel/toe pieces put into place and adjusted -- not rails / etc mounted. Fingers crossed. Actually it is a good system. What I like most about the EVO is that it has a zero ramp angle uncommon in todays systems. I assume they ship from Nordica with the base plates / rails already installed? Just ordered a pair of head i.Supershape Rally Skis w/PR Bindings. I'm a little bit excited. Thank you @Philpug for the help! David Matheney, Ron, Lorenzzo and 2 others like this. Demo'd some i.Supershape Rally's for the first time this year. Beautiful mix of power and not-overly-demanding as a carver. If I was living on the east coast they'd certainly be in my quiver. David Matheney and Stephen like this. David Matheney, SkiNurse, Philpug and 1 other person like this. When the Rallys arrive, I think it is best that I take them out and make sure they are skiing up to snuff. Free safety check service? Wow. Dude owes you at least a beer, if not a dinner, for that. Slaverson, jmeb, Philpug and 1 other person like this. If you could that would be great. That way they will already be trained to ski correctly when I get on them. David Matheney, Tricia, VickieH and 1 other person like this. Tracking says they will be there on Thursday. Philpug and jmeb like this. First year I've had a tree in my own home (always gone at xmas) so no decorations to speak of. But I put the tree up nonetheless, and 'mounted' the recent purchase. Mounted is in quotes because these were by far the easiest system binding I've dealt with. Super intuitive and quick. Nick Golden, Ron, Tricia and 2 others like this. 4 OEM Chevy Silverado 265/79 R17 rims for $150 this last weekend! These will get some snows or ATs to get me to and fro the local (but small) slopes when the weather looks promising. at 50 and 60 miles, money well spent to help me and family on the road. skibob, Lorenzzo and AmyPJ like this. My Christmas present from DH! Purchased for $323 including bindings! AND, thanks to a new Columbia outlet store across the street from my school (YIKES!) I bought my man 2 new ski jackets and a fleece for $200.00. They even had an educator's discount. I can walk there and back and spend copious amounts of money in under an hour. I am in serious trouble! I don't think this would cut it at @SkiEssentials but they were safe and sound. Getting waxed now. Karen_skier2.0, AmyPJ and Stephen like this. My Enforcers are set for tomorrow delivery. Joel says we will get 10-20" between Friday and Tuesday. But I promised my wife that they would be going under the tree for Christmas. skibob, Wink73, Monique and 1 other person like this. So stoked! I can barely stand it!